The Copan Community Action Team gave The Journey Home in Bartlesville $15,000 in donations Saturday morning. 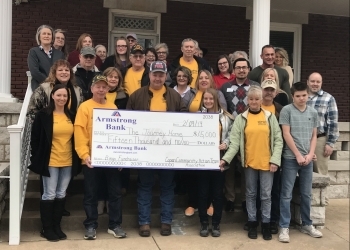 The Journey Home's Executive Director Brennen Murray says the organization put on a Bingo Night at the Washington County Fairgrounds on Jan. 26 to benefit The Journey Home. She explains that a gentleman associated The Copan Community Action Team had a loved one in Room 1 in The Journey Home 6-months ago before they passed. He wanted to put on the recent Bingo Night to benefit The Journey Home in rememberance of his mother. Murray would go on to say The Copan Community Action Team normally puts on this event to help the Copan community with their fireworks show and other community events. She says their organization does give away one Bingo Night effort to a local group in need. What The Copan Community Action Team was able to do for The Journey Home has blown the minds of the staff and the board. While it may seem uncertain if they will have another $15,000 donation like this again, Murray says The Journey Home is blessed to have been the recipient this go around. Doug Quinn, a Journey Home board member, says the generous donation will go towards their operating costs. He says that includes electric bills and staff costs. According to Doug, 95-percent of their budget goes towards their caregivers and their salaries. Normally one nurse works every 12-hours unless they go over four guests in The Journey Home. Quinn says they normally house up to six guests and have to double up the staff when they reach six occupants at one time. The Journey Home allows their guest's families to stay in the home if they visit from out of town too. If they can afford to do so, they make dinners for families that visit from out of state. However, local churches donate meals most of the time. If you would like to make a donation to The Journey Home, you can give them a call at 918.876.4184. Quinn says they operate 24/7.